New for 2018, it’s our Summer egg CSA! 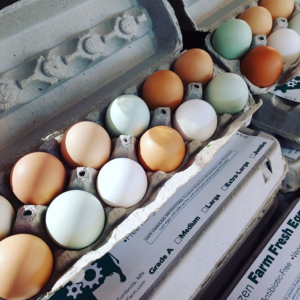 No need to fight the crowds, with an egg CSA membership we’ll set aside a dozen eggs every week just for you. Can’t make it to the market every week? Need two dozen eggs for a special occasion? Our egg CSA card has the flexibility to fit your busy summer schedule. You can skip a week (or two, or more) without losing out on your eggs. Need extra eggs for your big summer adventure? You can pickup an extra dozen anytime you need (based on availability). We will hold your egg share until noon each market day (they’re perishable after all). If you’re picking them up later than noon, please let us know by phone/text/email. Hurry! Only 50 shares available for the 2018 season!